Amid Chaos, Venezuelans Struggle To Find The Truth, Online As Venezuela grapples with a major political crisis, people there are struggling with misinformation online. WhatsApp, a popular messaging app, has been used to spread both rumors and news reports. 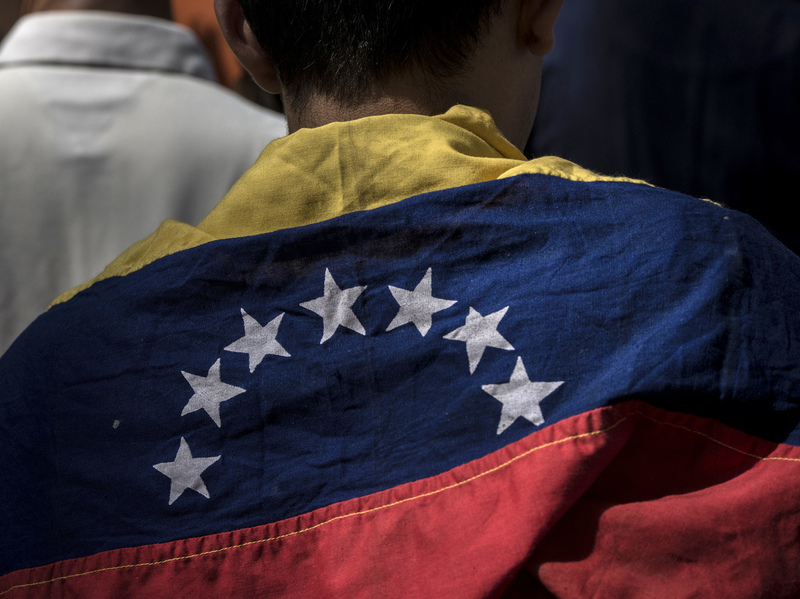 An attendee wears a Venezuelan flag during a rally in Caracas Friday with Juan Guaido, president of the National Assembly, who swore himself in as the leader of Venezuela. In recent days it's gotten even more confusing. President Nicolas Maduro has refused to cede power to the opposition party. There have been widespread protests and looting — and the rumor mill has been churning on social media. But many Venezuelans have found a way to use social media in their favor. Javier Rojo owns a pharmacy in the capital city of Caracas. As the chaos started, he gave his workers the day off, went home and turned on the TV — only to find nothing was being reported. "Independent media has been gradually attacked or shut down over time," says professor Gregory Weeks, who teaches Latin American politics at the University of North Carolina at Charlotte. "So that in general social media becomes the means by which you learn what's going on, on an ongoing basis." Back at his house, Rojo says he started getting messages on WhatsApp like this one from from one of his employees: "Tanks are rolling into the park. They are launching tear gas." But then, Rojo started receiving WhatsApp messages with rumors from people he doesn't even know. One man, who says his aunt's husband is a military officer, swore that Maduro has resigned. Professor Raisa Urribarri researches technology and politics at Universidad de Los Andes in Venezuela. She says it's hard to trace the origins of some messages in Venezuelan social media. They can be from panicked citizens, the opposition or the government. It's not the first time social media has been caught up in international turmoil. Last year, the military in Myanmar used Facebook to spread rumors about the Rohingya Muslim minority — eventually leading to atrocities. In Brazil's last presidential elections, gossip about candidates spread like wildfire on WhatsApp. WhatsApp, which is owned by Facebook, recently announced it will no longer allow users to forward messages to more than five people. Still, Urribarri says, Venezuelans have lived with misinformation for so long, they've become smart news consumers. She points to a WhatsApp group called Servicio De Informacion Publica, or Public Information Service. The audio messages sent on the group are so low-production, they almost sound fake. But it's a service created by Venezuelan journalists, who were tired of all the fake news and censorship in the country. Every few hours they release a bulletin, which gets shared countless times on WhatsApp, Facebook and Twitter. In one broadcast, the announcer listed the neighborhoods and streets that have been experiencing violent clashes, looting and government repression. "Follow us," he says. "We are online."